On Thursday 7 October 1852 the Museum Meermanno officially opened its doors. The day of the week was not a coincidence: in his will Baron van Westreenen had stipulated that his museum should be opened on the first or third Thursday of the month. Many changes had already been made to the house on the Prinsessegracht by then, and in the following decades there were some major renovations, but even today anyone entering the front and rear hall of the Meermanno will see a rare example of a 19th-century museum interior. The museum objects are not only displayed, but also stored here, just as was the custom in the 19th century. In former times the front hall, also called the ‘book room’, served as a reading room too; people who wanted to consult books could examine them at tables in front of the window. The baron preserved his most valuable objects in this part of the house. There was good reasoning behind this: the room is not too close to the roof, not too close to the ground and faces north (less sunlight, less warmth). The wall cabinets were made by H.P. Terwinkel (or Ter Winkel), the master cabinet-maker who had already worked for Van Westreenen – he even supplied the latter’s coffin. 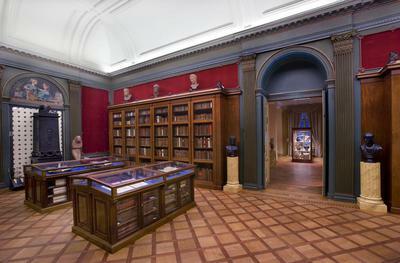 Sitting on top of the cabinets are 18th-century busts; some are copies from antiquity. The mahogany showcases were placed in the middle of the room in 1892-1893; they are modelled after the bookcases on the wall. These showcases also contain the ‘large formats’ – books which need to lie flat because otherwise their spines will sag. The famous Blaeu atlases, for example, are stored in these cabinets. Incidentally, we know where the first visitors to the museum came from: it appears from the notebook of the National library’s curator that Queen Sophie and some other unspecified members of the royal family visited the museum on 27 December 1849 from two o’clock until four o’clock. Naturally this was also a Thursday.